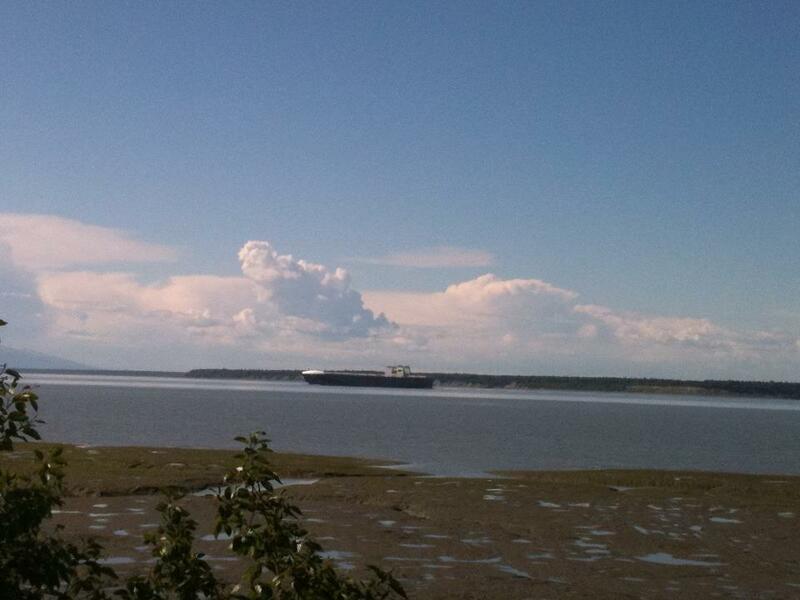 Distant barge near the Port of Anchorage. Commander Walther Kolle lined up periscope crosshairs on the SS Tillie Lykes amidships. U-boat 154 shimmied as the projectile sped toward the enemy’s perfect silhouette against a gray morning haze. The German submarine commander shifted his weight to one black boot, willing his torpedo a little north, but the explosive lance detonated slightly astern of the freighter’s midsection — a few feet aft of his intended mark. Kolle swore under his breath. He had intended to pierce the ship’s engine room dead-center. At 3:48 a.m., the Tillie Lykes sucked ocean into a jagged maw, and flames engulfed the wheelhouse where Kolle imagined the shipmaster met his end. Kolle’s kill moaned as steam lines ruptured and spat white vapors into the air. He scanned the sinking vessel with his periscope fore and aft, transfixed by the freighter’s death throes. Of course, no sailor working or sleeping in the belly of the ship survived — but dozens of deckhands typically scurried like ants, trying to leap over rails before the ocean swallowed iron and flesh. This old freighter seemed resigned to its death; only three figures stood at a rail of the listing deck, and below them a single floating life raft bumped the side of the doomed cargo ship. Rivets popped from heat, and the Tillie’s iron bow split from the stern, ripping the wound wider. Captain Kolle cursed again as he tried to identify the freighter, but he couldn’t see its name in the dawn’s half-light. Suddenly the Tillie plunged beneath the waves like two halves of a steel barrel. Ignited oil roiled with the ocean swells, and the Nazi commander marked his journal: Direct hit; 18 seconds until torpedo impact; two minutes and 30 seconds to sink. Kolle ordered his submarine crew to surface, vexed at his target’s lack of military courtesy. Obviously the freighter was one of America’s defenseless merchant ships, but Kolle’s peers might question his ambush if he failed to deliver the name of the vessel. The commander climbed to the open bridge above the conning tower. Sultry gray swells rolled between U-boat 154 and a flimsy canvas-clad life raft. Five men lay or clung to the wood slats lashed between its leaky pontoons, and he hollered his best English over the roaring wind and slapping waves. Only one man on the raft spoke English — and I was barely conscious. I bled from a deep wound in my side. The other sailors shrugged, waved and cried for help in Portuguese. German U-boat Commander Walther Kolle descended his conning tower and set a course for another kill, leaving us bobbing amid debris and bodies. I was 17, cleaning cow barns and repairing tractors on my dad’s dairy farm the day the Japanese bombed Pearl Harbor. Adolf Hitler declared war on the United States four days after the Pearl attack, and Nazi Admiral Karl Donitz launched Operation Drum Beat — a long-ranging scheme to sink every merchant ship supplying arms, fuel and food to Allied troops. With only 21 weapons-ready unterseebootes (submarines), Donitz ravaged the shipping lanes of Britain and the United States, while Hitler ordered hundreds of subs mass produced at Bremen. Seamen called these merciless ship killers U-boats, and Germany soon controlled Atlantic and Pacific cargo routes with their wolf packs. Blame Captain Jim for my obsession with ships and faraway places. My aunt Gertie, Dad’s youngest sister, married Captain Jim Barber, retired master of a fuel tender who sailed the Inside Passage from Seattle. When I was near 13, middle-aged Jim and Gertie honeymooned at our dairy farm, and with big round eyes I plied Gertie’s captain with questions at my father’s grand oak table. Our big Federal woodstove (and my father’s homebrew) warmed the mariner and his audience as Captain Jim roared about monster swells he rode on a freighter rounding the Horn of Africa. I was never the same after the captain’s honeymoon at the Gallear family farm. I dreamed of escaping manure and milking machines, and Dad’s hope that I might stay and help make the farm profitable drifted out to sea. My grandpa, Samuel Curry, Mom’s father, had emigrated from Northern Ireland. He labored as a boilermaker back East until working his way west. My grandmother, Lizzie, sailed away from Central Ireland to South America around the time of the Great Potato Famine. She traveled by mule through Panama, then sailed up the coast to Port Townsend, Washington. Grandpa Sam married my grandmother, Lizzie, and homesteaded in the Chimacum Valley, until they nearly lost the farm during the Great Depression. Grandpa and Grandma Gallear had emigrated from England and homesteaded at Yelm (195 miles from Chimacum), and Dad was one of 14 children. My mother, Marguerite, grew up at Chimacum and taught school there. She married my father, Albert Gallear, and together they settled at Yelm until opportunity knocked. I was 5 years old when Dad loaded two Model T Fords with our belongings to settle at Grandpa Curry’s farm at Chimacum. Throughout the Depression, Dad worked side jobs all over the county to save my grandpa from the bankers. Later my father bought the Curry farm and, in time, squirreled away enough from harvesting canning peas, acres of sugar beets and other crops to buy dairy cows. “Eldon! Get your a** outta bed, and get those cows in the barn!” (Dad’s barn-holler is still echoing in my brain 80 years later!). At 4:30 a.m., my feet hit the cold wood, and I hoped that the old two-cylinder milking machine wouldn’t hiccup before the last cow was finished. After calling in our 40 Guernseys and Jerseys and washing 160 teats, it was my job to tinker and tweak the machine morning and evening to keep milk flowing to the tank. I hated cows — but unbeknownst to my father, he was planting a passion for machinery in my mind. I lived and breathed pistons, crankshafts, spark plugs — and later, massive boilers and steam engines propelling multi-ton freighters. When local farmers learned about Chimacum’s 12-year-old mechanical prodigy, my father faced stiff competition for my time. Dad grudgingly loaned me out; it was the neighborly thing to do. I graduated from high school (under threat of death) and left our farm while my mother wept and my father cussed. They were shorthanded now, even with my two brothers and two sisters. I escaped to the docks of Seattle and applied for duty on the SS Shasta, a 216-foot ferry serving Port Ludlow and Edmonds, Washington. It seemed to be an answer to my prayers as I threw down my sea bag in the firemen’s quarters, with coarse men of the sea like Uncle Jim. All my growing-up years my dear mother and Grandma Curry insisted that us Gallear kids attend the Methodist church for Sunday school. And the day the Shasta departed Seattle, I figured I was pretty close to heaven. It wasn’t my father’s voice — and a peach-fuzz grin stole over my face. My bare feet hit the deck — this time iron cold. I followed my shipmates to the galley and swallowed hard biscuits before my first exciting day below decks in the humid, thunderous engine room. Steam belched from escape valves. Massive pistons slapped inside steam cylinders powered by blackened burners drinking barrels of crude oil. Inside the Shasta’s noisy belly, I aspired to one day be a steamship fireman — one of those dependable men who controlled the steam pressure ordered by the ship’s master in the wheelhouse above. It took me two separate ferries to run the gamut from wiper (cleaning up messes) to water tender (supplying water to steam boilers) and oiler (lubing engine parts). Helpful engineers pegged me as a full-fledged fireman on a Puget ferry someday, but I knew that it was just a matter of time before I tossed my sea bag aboard an ocean-bound ship. I bid farewell to my companions on my second ferry, Seattle’s SS Iroquois, confident in my abilities to land a job in any engine room. I planned to work from the bottom, just like I had on the ferries — but this time aboard the SS William L. Thompson, my first freighter. Cargo ships on the Pacific Coast had been requisitioned to haul fuel, freight and troops wherever the Navy commanded captains to go. The SS Thompson (built in 1917 for World War I in Scotland and fondly called The Long Time Tommy for being one of the slowest ships in the fleet) now served the tiny harbors along Alaska’s Inside Passage, the same route Uncle Jim had sailed. But, as I stepped upon the gangplank of the Long Time Tommy, I frowned at a more immediate problem than German gun boats. Stories of the Thompson’s bully had fouled our galley on the Iroquois, like smoke from a dirty stack. I hoped that the brute worked above decks, leaving us firemen to do our jobs in peace. A few minutes before 8 a.m., I stepped off the gangplank into cold morning shadows aboard the William L. Thompson to report for duty. My duffle weighed down one shoulder, and suddenly a voice scraped my hopes raw. The brute stood a head taller than me as he shuffled into the sunlight, and I blinked hard to focus on his sneer. I tossed my sea bag on the deck and glanced toward my destination, the bridge, where the captain waited. But not a soul stirred anywhere. It took me just a second or two to gather my wits for an answer. I was an artist at quick comebacks, often defusing a tongue lashing or thrashing from my dad. “Does that include our master and the mates?” I asked respectfully and set my boots flatfooted on the deck, turning sideways a bit. It was enough. I knew the pecking order by heart as a U.S. Merchant Mariner. I was a seaman and no d*** patsy. I reached low, about the elevation of my crotch, then stroked upward like a steam piston against his jaw, lifting him to his toes. He flopped to the steel deck like a limp cod and lay still by my sea bag. Blood oozed from his mouth, and I glanced at his broken teeth as I stepped over him to report for duty. A couple cronies collected the brute later, but they couldn’t find a hunk of his severed tongue. I never met the bully again, and no one messed with the engine room crew on our 10-month voyage supplying fuel and equipment to troops digging in on the Aleutian Islands. I’ve always felt sorry about my youthful indiscretion, but in the grand schematics of life, perhaps I saved my shipmate. It’s hard to take a bully seriously if he talks with a lisp. And just maybe it shamed him away from mouthing off to a sailor wielding a sharpened marlin spike. Aboard the Long Time Tommy, I dogged the steps of the engineers and fastened their skills to my brain. I polished my aptitude to a blinding sheen and soon advanced to water tender. Friendships are often made for life aboard a vessel, and mine, with the Poet of Long Time Tommy, will last into eternity — though we parted and never laid eyes on each other again. I felt a twinge of homesickness for my father and mother as I described my family and childhood and how I ran off to sea. And he did. His words unfurled like a ship’s sail, describing my young life at sea and what home really means. The drum beat a deadly cadence. I stood at the rail of the SS Island Maiden at a port off the coast of South America, watching sweating, bronze-skinned men lining the dock shoulder to shoulder, beginning at a warehouse two ball fields away. The human conveyor belt snaked aboard our ship and down into the Maiden’s dark hold, where green bananas were stacked by the ton. Suddenly, the drum stopped. A single 125-pound banana stalk slipped from one man’s grasp, and he crumpled to the dock as husky natives kicked and beat him unmercifully. When he stopped screaming, the drums resumed their cadence. Another native stepped in line to fill the bloodied banana handler’s place. The workers were paid 10 cents a day, and we loaded 7,000 tons of green bananas in less than 48 hours. Aboard the Island Maiden, I worked in the engine room as an oiler, and like all merchant seamen, I was required to sign ship’s articles promising that I would sail to our destination and back to the United States port. We left South America for Galveston, Texas, where I expected to collect $110 for my month below decks tending the Maiden’s engines. My mother had instilled in me that a man was made in the image of God and that life was precious, but in foreign ports and sometimes even aboard ship, reality ran cross-grained to my young convictions. One vicious captain I sailed with from Manila never made port in San Francisco. Nobody knew where he went — officially. But the crew had an inkling. He was no d*** good and somehow fell overboard after arguing with an iron pipe. A master could be testy, but not cruel and unreasonable if he wanted to maintain his crew’s respect. At Galveston I waited aboard the Maiden for two days, waiting for pay that never came. I went ashore and met two other merchant seaman. That was enough for me, and I grabbed the first cabbie I could find who knew where she docked. I no sooner hopped off the gang plank than the engineer fastened his beefy fingers on my arm and asked my line of work. “Fireman, sir.” I grinned, and down we went to the engine room 30 feet below decks. The Tillie was a demanding, cantankerous old gal, and the fireman I replaced was done with her. His eyes looked like two pee-holes in a snow bank, and he couldn’t wait to shove off. The engineer was so frazzled that he forgot to give me ship’s articles to sign, and I didn’t insist. I just went to work — a ghost learning the tics and twitches of old Tillie as she gathered steam to leave Galveston. We were bound for Puerto Rico, and formal paperwork wouldn’t have mattered, anyway, since no Coast Guard or Navy ship even bothered to search for a scrap of the old bulker — or her 30 merchant sailors who they thought had vanished without a trace. “We’re after a short load of bauxite to make aluminum for our planes,” our engineer told us as we rumbled across open seas toward Puerto Rico. I had no idea that Nazi U-boats infested the Caribbean like wasps on fresh meat. Our Captain, Gus Darnell, zigzagged a worried course at varying speeds to confuse undersea navigators studying American shipping lanes. Darnell’s last ship, the Cardonia (also unarmed), had been shelled by German deck guns off Haiti, and Darnell and his crew had escaped in lifeboats before a U-boat finished off the Cardonia. Everything aboard the Tillie seemed put together hastily, including our skeleton crew of Brazilian deckhands who spoke Portuguese with a dash of broken English. And our black gang (engine room workers), a mix of Irishmen and Americans, had no replacement for a single injured or sick fireman. I hoped that Darnell would fill out our contingent when we docked at Puerto Rico. We ran at full speed ahead morning till night, and night until morning. I had taken the groggy morning watch, and all was well with the pulsating pistons inside the massive ship’s cylinders. Six burners roared, and black smoke belched steadily in the Tillie’s wake. Captain Darnell hadn’t changed his orders: Forward. Full Speed. Steam pressure: 200 pounds. Everything seemed skookum, as Uncle Jim used to say. That June morning our Tillie Lykes joined a seafloor graveyard with 336 Allied ships sunk by U-boats in the Caribbean in 1942. Seconds after the German torpedo hit, I scraped myself off the boiler deck, 30 feet below the ocean surface, dazed and groping for handholds in the pitch black. Yellow sparks flashed, lighting the engine room intermittently. The ship was already listing and vibrating. The Tillie’s pistons throbbed valiantly for a time before saltwater drowned her boilers. I came around long enough to feel the cold steel handrail in my fingers and see the roiling ocean 20 feet below. A life raft bobbed at the Tillie’s rising water line, where two Brazilians motioned excitedly, screaming in a foreign tongue. I left the ship then — in mind and body — belly flopping onto the rolling swells. The two crewmen had tossed me in the drink and saved my bacon. I regained consciousness, heaving up saltwater, while strong arms hauled me aboard the rickety life raft; they dragged my sopping cohorts, formerly standing at the Tillie’s handrail, inside, too. I wasn’t aware of the next few moments, as the Tillie Lykes succumbed to the waves. My four Brazilians must have rowed quickly away from the freighter before her plunge, or we might have filled the empty wake, chasing our sinking Tillie down. Drifting in and out of consciousness, I recall shouts minutes after the sinking. It must have been the unsatisfying conversation between our savage unterseeboote nemesis, Captain Kolle, and the Brazilians. There are some things a man never forgets, even after nearly 70 years. My first kiss. My first job aboard the ferry Shasta. The confrontation with a bully aboard the Thompson. Riding out a tidal wave in the Aleutians. I was alone in the life raft, and I don’t know for how long. My four friends had been rescued by native island fishermen, and I guess they figured I was dead — as much blood as had drained from the gash in my side, between the raft slats and into the ocean. I hated being conscious to feel the bumps and nudges. Great white sharks gathered in the wake of ocean carnage, and no wounded man survived long in the warm Caribbean. Vultures of the sea cleaned up after every German kill. Sometimes my raft’s canvas pontoon would lift into the air, then slap the ocean surface as a shark tried to roll me off. They seemed frantic in the beginning, smelling my blood in the water. But as my body naturally staunched the stream, the sharks just circled, playfully thumping the slats beneath me. I believed that I was about to die. I lay like an invertebrate, my muscles spent and limbs feeling like boiled macaroni. The afternoon sun seared my face and bare chest, while I waited for angels to bear me up and away. They had expedited my climb up the companionway after the torpedo hit the Tillie when I was shell-shocked. How else could I have escaped certain death in that engine room — a U-boat captain’s textbook sweet spot? I have no idea how long I cooked in that life raft. I had entered a dream state, unaware that the crew of an anti-sub seaplane rescued me from the circling sharks. The Martin Mariner flew me to Panama, where young Navy doctors seemed anxious to write my obituary. I was a mess. Shrapnel had ground into my intestines, and I had little blood left to bleed anymore. I briefly came to, lying on my back upon a mattress, staring at a dingy ceiling. I felt aware of a figure beside me, and I turned my head to focus upon … white stockings! Was I in heaven? No — I still felt too much pain. “Where am I?” I croaked weakly. “Margarita Hospital,” a gentle voice said. I turned my head slightly toward footsteps and would have asked more … but my guardian angel vanished. I passed out again. While I slept, an elderly family doctor looked me over and upset the consensus of Navy physicians. Sending this old doctor is one more mystifying circumstance that I read in the diagram of my eventful life. After picking out parts of the Tillie from my intestines and removing my shredded appendix, the old healer closed me up. I awoke after surgery, but my guardian angel hadn’t returned. She had been replaced by two soldiers at each end of the room holding M-1 Garand rifles. German POWs filled this recovery station, and I tried to sit up. I raised my sunburned arm weakly and flashed my sailor’s ID number: 11-738. “This oughta tell you something! I’m a merchant seaman outta Seattle!” I was getting my old vinegar back, and it felt good. Now if I could just get away from all these Krauts. The next day they transferred me to another ward. Thank God for my tattoo, made-to-order for just such an occasion. The Red Cross seemed to be in charge of care and communications for hospitalized troops — and they were less than helpful. All I needed was a pencil, paper, envelope and stamp, but these items seemed as rare as fresh cream in a ship’s galley. Weeks oozed past as I recovered my strength, and I worried that my survival letter might not beat the inevitable death letter speeding its way to my parents. The Navy would regret to inform my family that all hands aboard the SS Tillie Lykes had been lost at sea. It was more than two weeks before I drafted a Salvation Army nurse to help me get a note off to my folks — too late. My mom had received an official Navy correspondence and couldn’t bring herself to tell Dad about losing the son who chose life at sea over milking cows on his Chimacum farm. At Margarita, in the painful watches of the night, I had little else to do but cogitate upon how and why God spared my life. Like a ship’s insistent bell, God’s voice tolled deep in my heart, drawing me closer to decision. Finally I knew it was time to set my compass for a new course: to serve this merciful captain forever. God had saved me from sinking with the ship and delivered me from the terrors of circling sharks. Now the soul within the sailor embraced Jesus for the first time. Before I left Panama, I asked Jesus, who in Bible stories walked upon the seas, to drop anchor in my heart, and in my 88 years, he has never left me. In fretful months ahead, I fought infection and military red tape, ending up in a Boston infirmary to heal. A government voucher caught up with me there, and I took a berth aboard a troop train back to Seattle. Then I drove home to see my family at Chimacum. At my father’s grand oak table, our tearful reunion shall always be a memory I treasure. After my experiences in the Caribbean, I began to live as if God had some purpose for my near-death odyssey. I’ve never been a man to broadcast my faith with a bullhorn, but thereafter, wherever I’ve labored, my Bible lay in view for all men to see. There was no use begging Elaine to change her mind. She was the first woman I really loved, and she was making me choose between her and my career as a merchant seaman. I was on a blind date with Peggy, her sister, when Elaine hooked me like a springtime salmon. Wherever I made port, I sent Elaine pictures and letters to impress her. After the Allies broke up the Nazi wolf packs, I figured it was safe enough to finally tie the knot, and I proposed. World War II had ended, but so did my dream. I felt like my ship had sailed without me. I told the dispatcher to get me on any ship, going anywhere — and I signed on as second engineer aboard the SS Angoon, a massive ocean-going tug that hauled barges up and down the Alaska Inside Passage. Dog Passion Daddy Deals was second mate on the Angoon, and after some months nursing my wounded pride, I didn’t feel one iota better. Deals (Marvin was his given name) commiserated with me because he had woman troubles, too, but nothing he advised ever made a lick of sense. We were bound for Anchorage, April Fool’s Day, 1946, and I had just finished my watch at 4 a.m. I shuffled up to the wheelhouse with a cup of Joe, when I stopped dead. The bosun (petty officer) and an able-bodied seaman stood like statues pointing toward the bow, with mouths as wide open as coffee cans. I followed their gazes, and my mouth dropped open, too. The highest wave I ever saw bore down upon the Angoon. Our tug groaned, and so did I. We climbed this giant swell about the speed of my dad’s ’26 Fordson, up, up, and finally we tottered onto the crest. My stomach flipped and jiggled coffee into my throat as I welded my fingers around a handrail to ride our ship to the bottom of the trough. Another sea mountain rose, and the skipper bounded through the wheelhouse door. We didn’t need to report; the next wave was upon us, slightly smaller, but just as wicked. After riding it out, the radio crackled from Adak Station in the Aleutians: Waves as high as 13 stories were wiping out Alaska villages and harbor towns. After the tail of the tsunami rolled beneath our tug, the skipper suddenly spread out his charts and studied them. We warned Adak Station and figured they’d contact Honolulu — but they never did. Without any warning, the April Fool’s Day tsunami struck Hawaii with 45-foot waves and killed 159 people. For a Merchant Mariner, it’s easy to change ships, but the hardest thing on earth is to walk the gangplank with his sea bag for the last time. Elaine had never left my heart, and with so many close shaves with death, I pondered over weighing anchor in some peaceful harbor. One day, as I strode the deck of a tug with a cup of coffee, I felt like Jesus sent me a message through nature telling me to settle down. The robins sang sweetly; gulls soared above Anchorage, looking for springtime nesting sites. I was 23 years old, and I had never really stopped courting Elaine. I saw her as often as we docked at Seattle and failed miserably at convincing the girl how novel it would be to marry a man of the sea. I threw my coffee cup into the Port of Anchorage, packed my sea bag and walked the plank. I was a full-blown engineer now, a master mechanic for diesel-generated steam systems aboard ships. I could tear ’em down and slap ’em back together blindfolded, so I landed a good job with the City of Anchorage maintaining its power plants. It was her turn to be hooked. One day a whole pile of folks told me to get down to the Alaska Communications office — I had a telegram waiting. They must have read my mail, because they seemed as excited as me. Elaine died of a kidney disease, and the same Jesus who had rescued me on the high seas helped me with the hard climb out of darkness once again. After a heart-wrenching memorial service, I continued to grieve my loss but a short time (except quietly in my soul). Now I had two daughters and an adopted son to raise by myself, and I found God’s solace in worshiping at Grandmother Curry’s Methodist church. I took the kids with me, and we heard Bible principles taught every Sunday that I wasn’t out of town repairing some diesel power plant. I seldom spoke of my sailing days, and during these family years, my memories anchored in harbors, silent, except in my mind. I understood God’s mercy in greater measure and hoped to somehow fulfill my destiny. I threw myself into being a good father — but my only mentors were ironfisted engineers and my dad. None had stroked me with praise for jobs well done. And in my father’s case, it was his way or the open sea. I chose the sea. Now I stood in my father’s big boots and with a family, too. How could I possibly balance laundry, school, church, suppertimes and my demanding work? I really needed a good woman, like Elaine, but in those perilous waters I felt like I drifted on a life raft again, nudged by hungry sharks. In decades to come, my family faced monstrous swells every bit as challenging as when Uncle Jim sailed ’round the Horn of Africa — and God only knows how we survived it. It was 20 below zero the day I smelled rotten onions at Kenai’s natural gas booster plant. I had arrived by helicopter from Anchorage to troubleshoot why the engines stopped cold. Leaning over a turbine, I mentioned the stink to one of the three gas plant technicians. He brushed me off, and suddenly I was somewhere else. I lay in a snow bank, sizzling. I beat my herringbone coveralls, trying to put out flames, then I realized my hair was burning. I burrowed headfirst into the snow, scooping a man-sized hole as fast as my burned hands would let me. After a few seconds of cooling my torso, I rolled out, dazed and trying to piece together why I sat in a cold snowdrift. Wasn’t I just standing indoors beside a turbine? A man hollered from somewhere. I suffered from shock and barely noticed the skin on my fingers and palms sticking to the cold iron wheel after I yanked my hands away. The valve was off, and the plant was safe now, so I joined the three technicians standing in shocked silence. None of the vehicles in the lot had any window glass anymore. Some were missing doors. Shelves inside one van had been blown through the front like shrapnel. We found one truck operable and crowded inside. George, the foreman of the plant, climbed behind the wheel, but something told me he wasn’t quite all there. Thank God for the high snow berms on the auxiliary road, or we never would have made it to the highway. We bounced between the berms like a pinball, and George never glanced in either direction as he swept into the long curve toward his Rainbow Bar. An ambulance came into view, sirens wailing, and the paramedics noticed us — I guess the missing windshield gave us away. But shell-shocked George never paused. He had a date with a barstool. I grabbed the keys out of the ignition and tossed them out the big hole where the windshield should have been. I spent a week in the hospital, hairless and bandaged up like a mummy. Something strange happened to me about that time as I ruminated on my brush with death. I had been blown completely outdoors, along with the walls of the natural gas plant, yet I survived. Deep in my heart God confirmed that my life was not my own. I belonged to the one who’d saved me one more time. By the time a man is 79 years old, he pretty well knows what he’s looking for in a woman. Fine lines have their place, but it’s what powers the lovely vessel that holds a man steady to his purpose and on a peaceful course. I had settled in Wasilla, where I lived alone in a house my grandson and I built from stem to stern. I arrived at my homeport for some R and R after a three-month stretch on Shemya Island in the Aleutian Chain, where I supervised an overhaul of an Air Force power plant. My daughter invited me to attend a little church called Sunny Knik Chapel — and the first time I visited, a feeling akin to a seaman’s weather sense kicked in. I just knew I should join up with this loyal crew. As I worshipped God at Sunny Knik, I heard the voice of Jesus, crystal clear in a way I had never known, and within months, I was destined to find the woman I had waited decades to find. When I stopped for a bite to eat at the Houston (Alaska) senior center, I noticed this young woman in the galley. (Later I found out that she was watching me, too.) A voice in my heart told me that this beautiful Rose was good. I hadn’t dated in more than 20 years, and Rose was a professional woman from Brooklyn, 10 years my junior. For much of her life she had assisted in operating rooms at a busy New York hospital. We were both entering uncharted waters, and I battened down the hatches before asking her out. I forgot my wallet on our first outing, and guess who paid for dinner? I figured that I had spoiled my chances for another date — but that’s what I love about my Rose. She has never jumped ship in the midst of a squall. Over the next few months, we fell head over heels in love, and Rose felt the same about the Sunny Knik Chapel as I did. She felt God speak to her there, too. Both of us abandoned our stuffy, liturgical past to follow Jesus, who I believe cares more about our hearts than about spit-polished shoes. Neither of us ever thought we would marry again, but that was before we met. “You mean it, Eldon?” she said. How God matched me with exactly the right mate after all these lonely years is more than a blessing — it’s a miracle. Rose says that she came to Alaska and found the face of God — in wonderful friends, in her worship of Jesus and in the majesty of the Last Frontier. I see God’s reflection, too — in my Rosemary. My purpose for living has never been clearer: I offer my life as a chart for others to study and sail by. Every wrinkle and scar tells the story of God’s mercy toward a seaman who sails for the Master Mariner of eternal seas. Far away from harbors where there are no ships around. Until they go they swear that it’s the only place to be. And I’d swear those hometown moonbeams were the best of anywhere. With starry-eyed expression and a lot of fancy words. The water in the lakes was even wetter, too. That mother nature had never been to any other place. Over lots of oceans, and a couple of hemispheres. From Boston to Calcutta; Missouri to Momart. And across the world I’ve seen it do the same above Shanghai. And watched it sail beside me cross the ocean to Rangoon. Were the same ones that shine on the corner grocery store. Looking up from the deck of the ship, you’d see your hometown star. Who scribes “I love you” on a tree. I never get to thinking where or which is best. And they sound the same in Swedish, or Dutch, or Portuguese. In Cape Town or Palermo or the island of Papeete. It smells just like a rose the girl in Brooklyn gave to me. I guess that’s right; it is the best! Yours, and mine, and his! When you get to see the beauty — wherever you hang your hat. I just read your story “Fate of the Mariner” and I am a little perplexed, was this autobiographical, which I would find unlikely, or a recount of a story told to you? My step-grandmother was Gus Darnell’s widow. I interviewed Mr. Gallear and his story appeared in a book published by his church. Thanks for your interest.